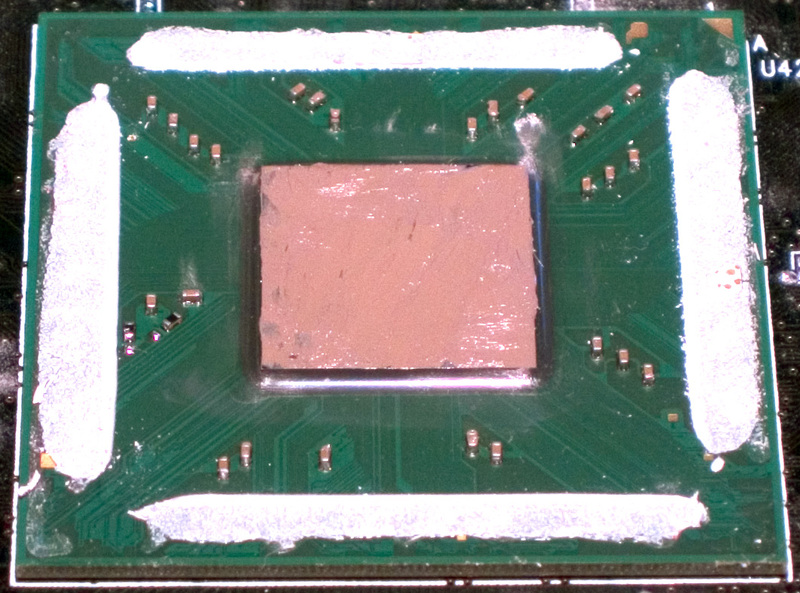 I decided to write up a brief little article on a good method of applying TIM (thermal interface material). 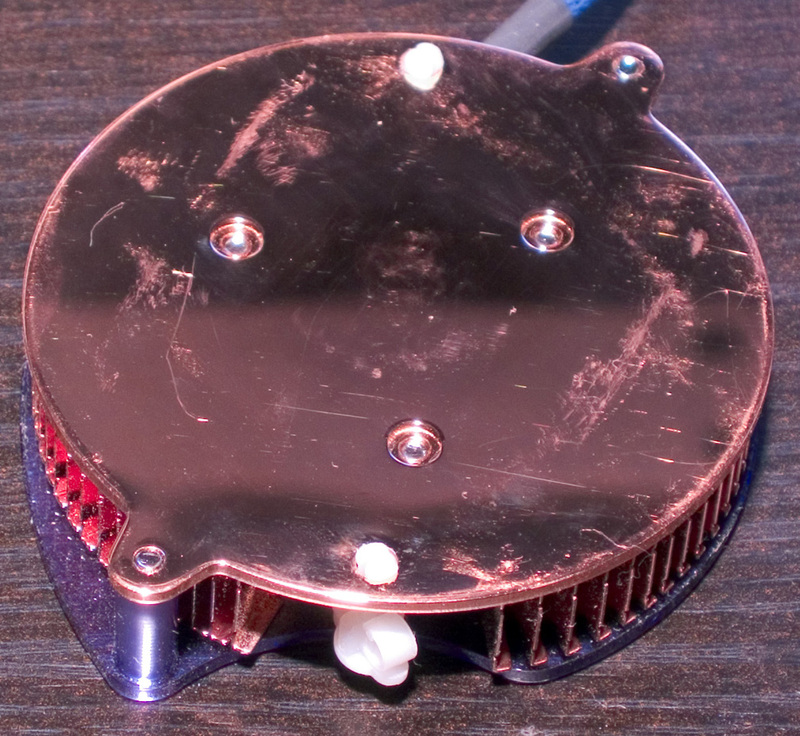 For this article, I used the Radeon 9800 and an Iceberq 4 heatsink. The pictures came out a little off-colored due to my little lighting experimentation (wanted to see how much I can compensate with the automatic settings in RAW mode to deal with my peculiar, "white," light lamp), but for reference I am applying Arctic Silver V using a plastic spoon. you can see the leftover materal on the packaging where the metal frame was. 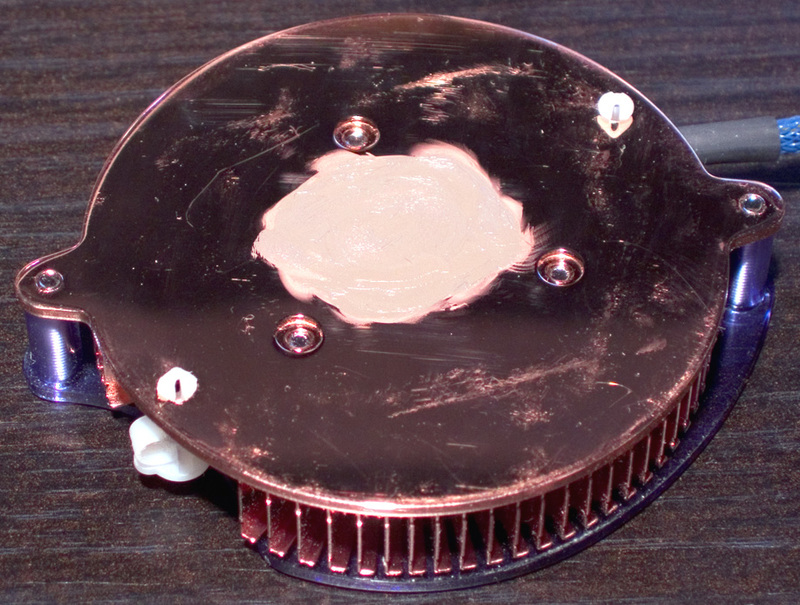 This is how the bottom of my Iceberq 4 looks after cleaning. (I know, I know--stupid move. Live and learn, as they say...). The Iceberq 4 normally is clean and faultless. and then did this core using only the residual TIM left on my spoon from doing the sink! I apply extremely heavy pressure with my plastic spoon and go in a circular motion in order to spread it out as thinly as possible. and that would be an extreme no-no! You can just make out my circular motions; the TIM fades off at the edges, it's so thin. when you pull your sink away, the resulting, "streaming spikes," would be larger--picture cheese pizza, piping-hot out of the brick oven. Here's the opposite side, underneath the sink. Again, notice just how little excess TIM is left rising or streaming away from the surface. I would like to add that for that last step, the amount of pressure I apply to squeeze the sink down to the chip varies on the application. 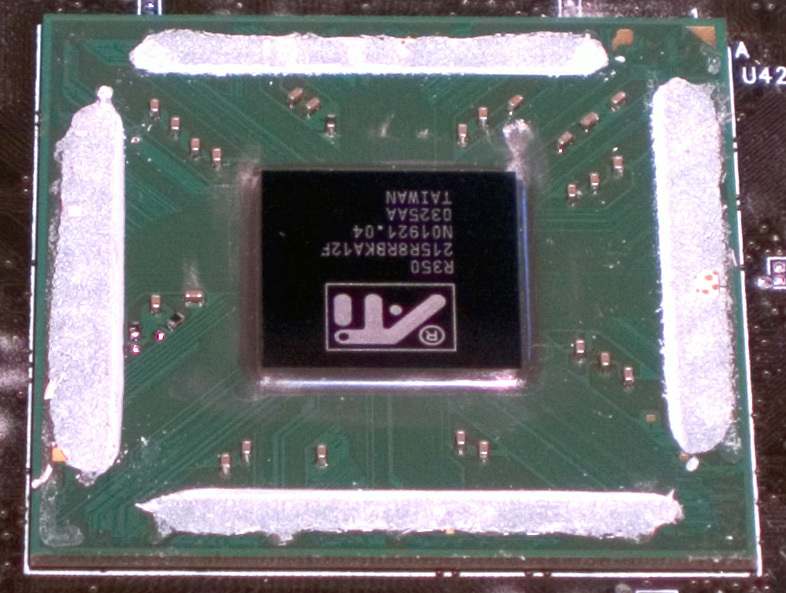 For Pentium 4 or chips with heatspreaders over them, I apply a little more pressure, particularly if the mainboard is not installed yet; I can place my hand underneath the board and the other hand holding the sink--if the motherboard is installed already, I use much less pressure so as not to damage the mainboard. For bare cores that are BGA packaging, I apply less pressure than on chips with heatspreaders, like I did for this VPU in my example. 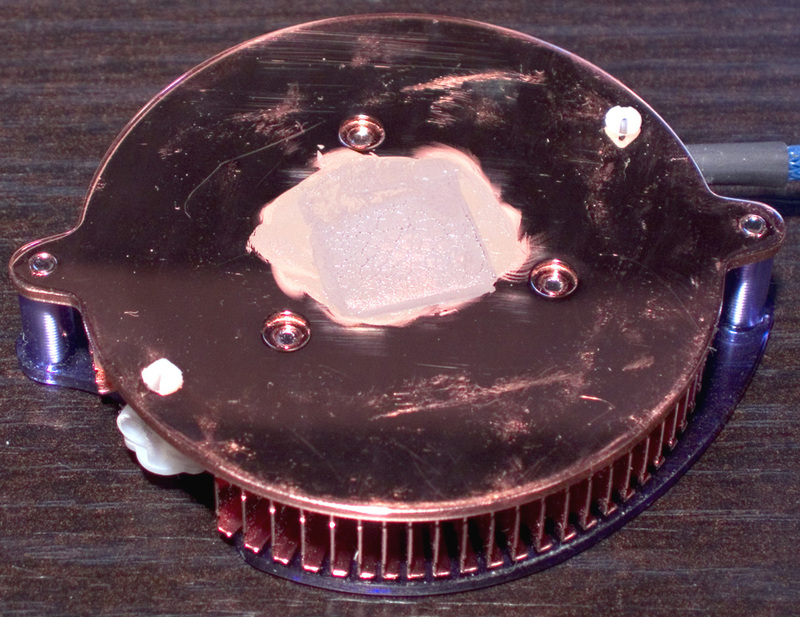 Finally, for very sensitive chips like the Socket A chips, which are bare cores with nothing underneath to support them (there is the hollow center of the socket underneath, which has been cause to many broken Athlon packages), I apply extremely minor pressure, certainly no more pressure than the heatsink itself will be applying once installed. If you were linked here from SilentPCReview.com, you can click here to return to the home page.